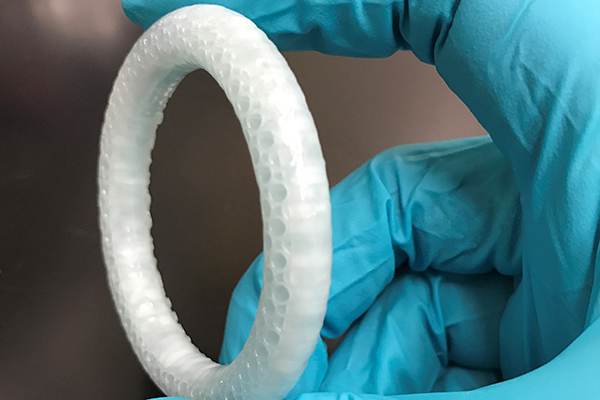 AnelleO, a company found by Rahima Benhabbour, Ph.D., is developing the first 3-D printed intravaginal ring designed to treat a women’s health condition. A company founded by Rahima Benhabbour, Ph.D., a faculty member at the UNC Eshelman School of Pharmacy, has received a KickStart award from the University of North Carolina at Chapel Hill to help create the first 3-D printed intravaginal ring designed to treat a women’s health condition. Benhabbour created AnelleO along with graduate student Rima Janusziewicz from the UNC Department of Chemistry. The company’s work is centered on 3D printed intravaginal rings that can be used as a platform for treating a wide range of women’s health conditions. Benhabbour’s research focuses on the development of novel delivery platforms and polymer-based devices that can treat or prevent disease. 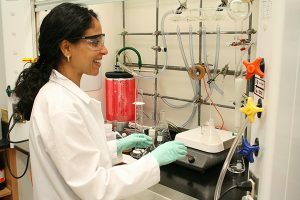 She said her work combines the elegance of polymer chemistry with the versatility of engineering and formulation development to design and fabricate efficient and translatable delivery systems for cancer treatment and HIV prevention. KickStart Venture Services supports the creation of faculty startup companies to help them complete high-impact projects based on University intellectual property. The commercialization awards, which KickStart Venture Services administers as part of UNC-Chapel Hill’s Office of Commercialization and Economic Development, are part of a campuswide effort to translate discoveries made in Carolina’s academic laboratories into products and services that can benefit people in North Carolina and around the world. Benhabbour is a research assistant professor in the School’s Division of Pharmacoengineering and Molecular Pharmaceutics and a member of the Center for Nanotechnology in Drug Delivery and has accepted an appointment as an assistant professor in the UNC/NCSU Joint Department of Biomedical Engineering. She received her Ph.D. in organic and polymer chemistry from McMaster University. “We are still in the initial stage of development for AnelleO PRO, AnelleO’s first product, but we are very excited about the technology and the wide range of applications it can potentially have in the future,” she said.